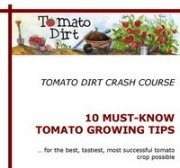 [Tomato Dirt] Grafted Tomatoes: What Are They and Why Grow Them? While grafting has long been a common horticultural practice, in recent years it has become a valuable technique in tomato disease management. Usually, at least one of the tomato varieties selected for the graft has outstanding disease resistance, most often a hybrid. Get 50% off Grafted Marzano Tomatoes (while supplies last) at Gardens Alive! Special Deals for Tomato Dirt-ers this Memorial Day Weekend! 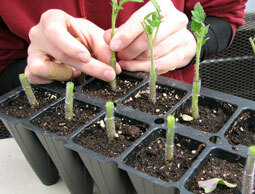 50% off Grafted San Marzano Tomatoes (while supplies last) at Gardens Alive! $20 FREE off your first order at Gardens Alive! Memorial Day Sale - $10 off orders $100 or More OR $20 off orders $150 and More at Garden.com! Now through 5/28. Tomato Dirt recommends TomatoFest, which offers over 600 varieties. © Copyright 2010-2012. TomatoDirt.com. All rights reserved.